According to the film critic William K. Everson, the horror film is the most unique of any film genre because rigid guidelines do not have to be followed as closely by the director or, for that matter, the screenwriter. The horror film's message of terror and death can be subtly communicated to the audience or conveyed in very intense (and ultimately disturbing) visual and auditory cues. While other film genres might use restraint and logical explanation as their overriding criteria, the horror film need not follow this standard formula; thus, many cinematic tricks and techniques are available to filmmakers to employ at their discretion. The end result is that the audience can experience a wide range of negative effects, from minor irritation to overwhelming nausea, when viewing a film of the horror genre. Based on Everson's remarks, one might conclude that the salient reason given as to why people watch horror films is that they want to be scared. In fact, this scare drive is so powerfully addictive to some viewers that they keep coming back to these films over and over again, desiring more terror and craving more thrills with each viewing. However, a deeper, more psychological explanation can be provided as to why humans have been fascinated with gore and bloodshed since the very beginning of recorded history. To help one understand this motivating force in the human psyche, one must consider Carl Jung's psychoanalytic theory of archetypes. Jung believed that all humans have inherited a set of primordial images that are contained in the collective unconscious. For the most part, these archaic images (referred to as archetypes) remain buried within the unconscious; at significant moments of one's life, however, they can be realized and fully expressed through religion, philosophy, art, literature, and, more recently, the cinema. Jung noted that the most powerful and perhaps most dangerous archetype of the group is the shadow. By definition, the shadow contains all of humanity's unacceptable behavior, bestial impulses, and repressed desires. Using a horror theme analogy, the shadow is "the Mr. Hyde to our Dr. Jekyll . . . the side of our personality that wants to do all the things that we do not allow ourselves to do [normally]" (Fordham 1966, p. 49). Thus, human nature is really comprised of two selves: an outward, everyday persona and a dark shadow that people try to keep in check and hide from others as much as possible. The neo-Jungian Carol Pearson labels the Jungian shadow as humanity's Destroyer. She explains that while people might be committed to promoting life and making the world a better place in which to reside, each and every person has a death wish that can ultimately hurt them and the much larger society. Pearson further adds, "Even the healthiest individual will do or say things that hurt other people . . . Ultimately, the Destroyer turns us into villains when we refuse to acknowledge and take responsibility for the harm we do—and we all do harm of some kind" (Pearson 1991, p. 145). Given this description of the archetypal Destroyer, it seems only natural that humankind is drawn to horror films. Every aspect of death that the psyche tries to keep hidden from the conscious self is depicted on the screen. And even though most of the cinematic acts of destruction are rather extreme and exaggerated forms of everyday reality, people are still compelled to examine them if for no other reason than to remind themselves that they carry around this death-dealing nature. This entry examines the various faces of death in this particular film genre, starting with the silent era and moving to the contemporary period. The dramatic changes in how death is portrayed on the screen across eight decades will be noted as well as how these images are related to the given sociocultural milieu of the times. The silent era of horror films focused almost exclusively on the hideous, deathlike appearances of the monsters rather than the ghastly crimes they committed against society. The chief reason was that the grisly makeup had to compensate for the lack of sound in these features. And so any number of strange and bizarre bogeymen that populated the screen greeted the viewer. Take for instance John Barrymore's Mr. Hyde (1920), which depicts the counterpart of Dr. Jekyll as a creature with a Neanderthal, almost satanic visage. Or consider the very first vampire film, the German silent Nosferatu (1922), that turned Count Orlock into a "walking skeleton" of horror with "his pale skull-like face, his blazing eyes, pointed ears, and long tapering fingernails" (Preiss 1991, p. 267). The Universal Studios period of horror films spanning the 1930s and 1940s continued to invest most of their special effects budget in the title creatures' features at the expense of adequate plot development, noteworthy musical scores, and prominent death scenes. Thus, the great works of literature like Bram Stoker's Dracula (1897) or Mary Shelley's Frankenstein (1818) were converted to one-dimensional productions with the ghoulish monster once again occupying the central position on the screen. The 1930 Todd Browning version of Dracula cast the Hungarian actor Bela Lugosi in the role of the Count. His broken English, exaggerated hand gestures, pasty face makeup, piercing eyes, aquiline nose, and high cheekbones gave Lugosi a kind of cinematic immortality for recreating the image of the Old World nobleman into a mysterious, somewhat disturbing creature of the night. Interestingly, very few humans would die at the hands of this cinematic Count, unlike his literary predecessor. The very next year Universal tried its hand at Shelley's Frankenstein (1931), giving the actor Boris Karloff his chance at fame for playing the Monster with a good deal of pathos. The film reviewer Byron Preiss describes Karloff in the following way: "tall, ill-clad, lumbering, with a square head and pegs sticking out from his neck, his face gaunt, his eyes baffled . . . he stands unsteadily with his arms upthrust toward the light which, with the innocence of the newborn, he tries to seize" (Preiss 1991, p. 243). And while the Monster executes some humans in the worst way imaginable (from drowning a child in the lake to hanging the hunchbacked servant with his own whip), these sequences take a backseat to the very realistic, corpselike appearance of Karloff that the viewer never tires from seeing. Other Universal monsters populated the screen during this interval, such as The Mummy (1932), The Bride of Frankenstein (1935), and The Wolf Man (1941). However, few would ever reach the stature of Count Dracula or Frankenstein's Monster in looks or atrocities, overt as well as covert. It was not until the 1950s that the creature features would return to the screen in a never-before-seen blood-thirsty glory by the Hammer Film Studios in London, England. More than anything else, the Hammer Studios wanted to attract a significant portion of the adult market to the horror film genre. Instead of banal scripts and terrible acting, the Universal story lines would be updated for that targeted audience with experienced actors like Christopher Lee (Count Dracula) and Peter Cushing (Dr. Victor Frankenstein) at the helm, delivering lines with vigor and enthusiasm. Perhaps the most salient addition was the effective use of bloodshed and gore at key moments to illustrate just how despicable these characters were to their unsuspecting victims. The movies were shot in a Technicolor brilliance (unlike their monochromatic predecessors), which only exaggerated the death scenes. Now the viewer would gaze at streams of blood gushing out from chests, necks, and faces in a potpourri of deep reds and bright purples amidst softer blue and green backdrops. Some examples of Hammer Studios' seventeen-year tenure in the horror cinema (from 1957 to 1974) are included to show just how much the Destroyer archetype had been modified to satiate the public demand for more atypical and bizarre ways of killing on the screen. The Dracula series of films began their run with some very striking scenes. In Horror of Dracula (1958) Van Helsing drives the stake into a recently converted vampire with a sickening relish. By the ending he traps Dracula in his own castle and, holding candlesticks in the sign of the cross, the good doctor forces the Count directly into the rays of the sun, thereby blasting the crumbling body to dusty remains. The follow-up movie, Dracula—Prince of Darkness (1965), involves the resurrection of the infamous monster by having his manservant brutally slit the throat of one of the guests at the castle in a Black Mass ritual. Dracula Has Risen from the Grave (1969) depicts one of the most graphic sequences of any vampire film to date. Here the Count survives a staking by pulling out the pointed object and throwing it at his attackers, but not before a significant amount of blackishred blood comes streaming out of the rather large hole made in the vampire's chest. As the titles progressed, Dracula would be stabbed, burnt, poked and prodded atop a bed of stakes, and even shoveled to death ( Dracula A.D., 1972) before meeting his screen finale at the hands of Van Helsing once more in The Satanic Rites of Dracula (1973). Like Dracula, the Frankenstein set had its share of memorable death moments. Beginning with The Curse of Frankenstein (1957), the Monster strangles a number of the local villagers with its bare hands before being shot directly in the face. The film critic John McCarty notes that Frankenstein is no better than his creation, "fondling brains, eyeballs, severed hands and other assorted organs" throughout the film with an unusual coldness that would bring new meaning to the term "mad scientist" (McCarty 1990, p. 19). The series continues this bloody path by having new creations eat the flesh of their victims ( Revenge of Frankenstein, 1959) as well as decapitate assorted bullies and store their heads in picnic baskets and atop bedposts ( Frankenstein Created Woman, 1967). Perhaps the most tragic of all fates occurs for the Monster when it is literally torn apart by the inmates of an asylum who spurn it for being so different from themselves ( Frankenstein and the Monster from Hell, 1974). In addition to the Dracula and Frankenstein films, Hammer Studios also produced one Wolfman picture. The Curse of the Werewolf (1961) ends on a sad note when the cursed creature's father shoots it in the heart with a silver bullet. The metamorphosis back to the human state never transpires, and so the camera lingers on the were-wolf's face that has bloodstained tears dripping from the permanently open, yet forlorn, eyes. Other British companies tried to emulate the Hammer horror treatments with some measure of success. The Amicus Company specialized in reanimated body parts that would seek out with a vengeance those parties responsible for their owners' deaths (see Dr. Terror's House of Horrors, 1965; Tales from the Crypt, 1972; Asylum, 1972; And Now the Screaming Starts, 1973). Elstree Studios, in conjunction with American International, gave a more human face to the Destroyer by casting horror film veteran Vincent Price in the title role of The Abominable Dr. Phibes (1971), who metes out justice to those physicians who could not save his beloved wife, Victoria. In 1992 Price disclosed in an interview with Stanley Wiater that he thoroughly enjoyed making Dr. Phibes, as it enabled him to throw a good deal of humor into the role so that the extent of his violent acts could be significantly diminished on the screen. And so one of Phibes's victims is drained entirely of his blood, another has the flesh on her face consumed by locusts, and still another is eaten alive in the cockpit of his plane by ravenous rats while the doctor attentively listens to his assistant Vulnavia playing beautiful music upon her violin. The send-up formula would be employed at least three more times by Price (in Dr. Phibes Rises Again, 1972; Theater of Blood, 1973; and Madhouse, 1974) until the actor became tired of the same old story line and eventually retired from the horror genre. But the violencehumor combination would remain a staple of the horror film from this point on. The American horror cinema was heavily influenced by the British faces of death, yet was able to impart originality to its less Gothic, more modernized tales of destruction. The mad slasher film became one of the most popular American products, starting with Alfred Hitchcock's 1960 masterpiece, Psycho. Playing the dual role of a disturbed young man (Norman Bates) and his dead mother, Anthony Perkins gave a much needed pathos to the brutal slasher figure that killed unsuspecting women taking showers in their motel rooms. The three Psycho sequels that followed ( Psycho II, 1983; Psycho III, 1986; and Psycho IV: The Beginning, 1990) continued to expand on the character of Norman Bates and were successful in large part due to Perkins portraying the aging madman as a misunderstood victim of his tragic upbringing. The statement Bates utters throughout the series, "We all go a little mad sometimes," would allow viewers to identify with his insanity and perhaps their own latent fears of losing control in an abusive environment as well. 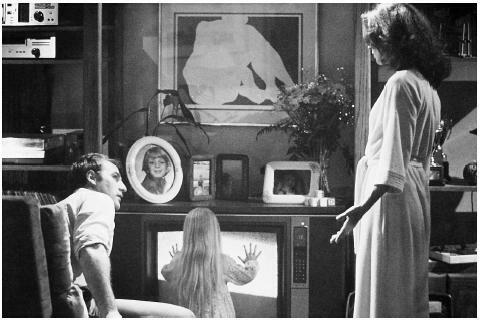 The 1982 horror movie Poltergeist, starring Craig T. Nelson, Heather O'Rourke (center), and Jobeth Williams featured scenes of paranormal activity and the undead, which originated from the family's television set. This successful film spawned its first sequel in 1986 and its second in 1988.
their brains to outthink their intellectually challenged foes. Silence of the Lambs (1991) and Hannibal (2001) are just two examples of how the Final Girl has evolved to the Amazon-worthy protagonist (Clarice Starling) to such powerful psychotics as Dr. Lecter. Another type of horror film capitalized on earlier works both in the United States and abroad ( The Innocents, 1960; Rosemary's Baby, 1968) and focused on a new death-dealer, the possessed child. William Peter Blatty's The Exorcist (1973) goes well beyond the limits of acceptable good taste and propriety by showing scenes of the satanic child Regan (played by Linda Blair) spraying vomit into the faces of the prostrate priests or masturbating with devilish delight using her crucifix. One reason that The Exorcist remains the highest-grossing horror movie ever made, setting the stage for many rip-offs ( Beyond the Door, 1975; The Omen, 1976; Damien—Omen II, 1978; Holocaust 2000, 1978; The Godsend, 1979; The Children, 1980; Children of the Corn, 1984; Child of Light—Child of Darkness, 1990) as well as its own inevitable set of sequels ( Exorcist II: The Heretic, 1977; The Exorcist III, 1990), is that it preys on parents' fears that they could lose their children to uncontrollable outside forces. Clearly, The Exorcist is a film that has reshaped the horror genre and continues to do so, as seen in adult possession hits like Stigmata (1999). The cannibalistic zombie image further pushed the envelope on what would be considered the conventional norms to a horror film. Starting with the cult classic Night of the Living Dead (1968), and continuing with Dawn of the Dead (1979) and Day of the Dead (1985), viewers are greeted by a more disgusting type of Destroyer—one that literally kills humans by devouring them—who dies then comes back to life (with whatever limbs or organs remaining) to join the ranks of the ravenous zombies, thus escalating the scale of the menace. Of all zombie movies made, the original Night of the Living Dead remains the most fatalistic. The film contains "dead relatives turning on living relatives, dead oldsters turning on living youngsters (and vice-versa) . . . with the nightmarish cycle repeating itself [over and over again]" (McCarty 1990, p. 103). What Night of the Living Dead 's screenplay writer George Romero wanted to do was show just how irrational the world had become with the breakdown of the nuclear family, wars waged without a just cause, and frequent assassinations of noteworthy, political leaders. While the zombie Destroyer has not been embraced to the same degree as the more traditional ones (e.g., the vampire and mad scientist), every so often a horror film surfaces with the hungry undead in it, reminding viewers that the worst hell on earth is never dying but living on indefinitely at the expense of destroying other souls. Many scholars and film critics believe that the faces of death within the horror genre will undergo a major facelift in the twenty-first century and beyond. Referred to as techno-mythic Destroyers, these new figures will either be created by the technological advances available or use that very technology to kill people in even more unusual and imaginative ways than before. Some technomythic Destroyers have already appeared on the screen. In the 1980s when television sets and VCRs were becoming commonplace items in every household, there emerged a rash of related cinematic terrors. In Halloween III: Season of the Witch (1982), the villain of the tale broadcasts his demonic message across the national airwaves to unsuspecting children while Videodrome (1982) allows the viewer to imagine a wide assortment of sadomasochistic pleasures via cable programming until they take on a frightening and mind-bending reality. By the 1990s, video games were becoming all the rage, so naturally horror movies mimicked the popular culture trend. Stephen King's The Langoliers (1995) has evil Pac-Man creatures terrorizing a stranded group of airline passengers in an alternate time zone; Phantasm III: Lord of the Undead (1993) portrays the Tall Man unleashing his horde of living spheres on the world in a new stage of the Phantasm game; and Lawnmower Man (1992) shows the recreated Jobe seizing control of the virtual reality universe and all programs tapping into that dimension. Based on these films, it seems only a matter of time until HDTV and DVD technology will be utilized by similar fictional Destroyers to wipe out human existence on the planet. Despite these changing faces of death in the horror film genre, one factor does appear to be constant—namely, the mythos of the human destructive potential. This dark half of human nature is filled with so many nasty images and sinister figures that eventually they will surface in full force. Humankind's hidden demons will continue to serve as fodder for future screenplay writers and directors in the film industry, and audiences will most assuredly see more of their inner selves on the screen in the decades ahead. Everson, William K. Classics of the Horror Film. New York: First Carol Publishing Group, 1990. Everson, William K. More Classics of the Horror Film: Fifty Years of Great Chillers. New York: First Carol Publishing Group, 1990. Fordham, Frieda. An Introduction to Jung's Psychology. London: Penguin Books, 1966. Iaccino, James F. Psychological Reflections on Cinematic Terror: Jungian Archetypes in Horror Films. Westport, CT: Praeger Press, 1994. Jung, Carl G. The Archetypes and the Collective Unconscious: The Collected Works of C. G. Jung, translated by R. F. C. Hull. Vol. 9a. Princeton, NJ: Princeton University Press, 1990. Kirkham, Pat, and Janet Thumim, eds. YouTarzan: Masculinity, Movies and Men. New York: St. Martin's Press, 1993. McCarty, John. The Modern Horror Film: 50 Contemporary Classics. New York: First Carol Publishing Group, 1990. Pearson, Carol S. Awakening the Heroes Within: Twelve Archetypes to Help Us Find Ourselves and Transform Our World. San Francisco, CA: HarperCollins, 1991. Preiss, Byron, ed. The Ultimate Dracula. New York: Dell Publishing, 1991. Preiss, Byron, ed. The Ultimate Frankenstein. New York: Dell Publishing, 1991. Preiss, Byron, ed. The Ultimate Werewolf. New York: Dell Publishing, 1991. Wiater, Stanley. Dark Visions: Conversations with the Masters of the Horror Film. New York: Avon Books, 1992.